In the spirit of the new year, RT is taking a quick look at a couple of fun lists (ok, they’re serious issues, but who doesn’t enjoy light-hearted list-making?). Looking back: Religion Newswriters Association recently released its ranking of the top religion stories of 2010 (voted on by religion journalists). The top five stories involved the Ground Zero mosque proposal, the earthquake in Haiti, the pope’s handling of priest pedophiles, the Tea Party Movement, and Obama’s health care reform bill. Looking forward: The Public Religion Research Institute posted 10 stories from 2010 that will affect us in the coming months. These include churches and homosexuality, immigration reform, and Americans’ religious knowledge. Still looking for a good new year’s resolution? Resolve to learn a little more about your neighbor’s faith this year. Click on the religion overviews in the top navigation to get some quick background information on the religions of people around you. Atheists and Agnostics appear to know more about religion than members of large religions throughout the United States, according to a new survey from the Pew Forum on Religion & Public Life, released this morning. The questions were a mixture of Biblical knowledge and knowledge of world religions. Jews and Atheists/Agnostics did far better on questions about world religions than other groups surveyed. 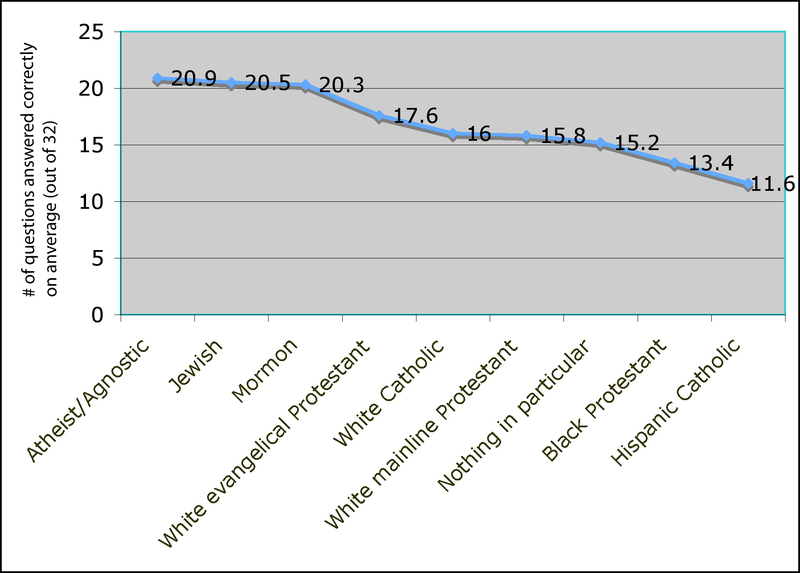 Mormons scored best on knowledge of the Bible, with white evangelical Protestants coming in second on Bible knowledge. 89% of respondents knew public school teachers cannot lead class in prayer. 82% knew Mother Teresa was Catholic. 71% knew Jesus was born in Bethlehem. Only 47% knew the Dalai Lama is Buddhist. Only 27% knew most people in Indonesia are Muslim. Only 23% knew public school teachers CAN read from the Bible as an example of literature. College graduates did better than respondents who only had some college or high school or less. Those who took a religion course in college did better than those who did not. When it came to race, white respondents did better than black respondents or Hispanics. Men did better than women. Respondents in the South answered fewer questions correctly than respondents in all other regions of America. Respondents aged 18-29 answered fewer questions correctly than respondents in older age groups. Frankly, when it comes to knowing our neighbors in terms of their religious beliefs, Americans in general are doing a poor job – particularly when it comes to knowing about religions other than their own. Regardless of your religious belief or non-belief, take some time to understand what people around the world believe about God. Understanding leads to the development of relationships and tears down walls of fear, intolerance, and hatred. Take the quiz about religious knowledge on the Pew Forum site. Then return to Religion Transcends and click on “Religion Overviews” in the top navigation to learn about a religion other than your own. Want more? Check out news from those religions in the “religion posts” drop-down menu in the left navigation. Have a question about a religion? Post it as a comment on this post.